Through Jess’s stunning narration, Nicky Singer explores the meaning of life, and the interconnected nature of all things – in a way which is entirely accessible to young readers. Singer is probably best known for the excellent, and prizewinning, Feather Boy. 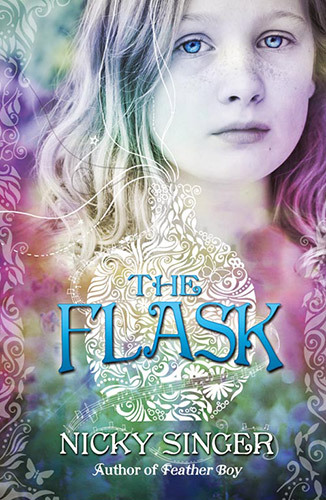 Like that novel, The Flask demonstrates a depth of emotional intelligence and the same predilection for a character-driven plot which is grounded in the recognisable, the everyday, the suburban – while simultaneously reaching out to the extraordinary and to the magical. The novel is written in supple first-person, present-tense prose that is clean and lean, and offers occasional flashes of poetry. The short sentences and short chapters will encourage young readers to keep turning the pages. 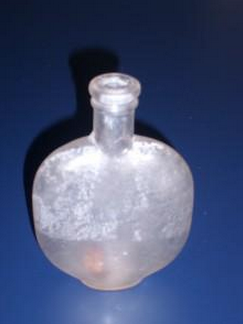 Actually, The Flask began with a bitter memory. I had a great Aunt, whose name was Eva (ah- I’d forgotten how nearly her real name crept into the book) who I loved very dearly. She didn’t have children of her own and, when she died, each of her five great nieces and nephews were allowed to chose something from her house as a gift. I chose her dressing table. This might seem a strange choice for a ten year old, but this is where we sat, Eva and I, when we were at our most intimate. The dressing table had a beautiful oval mirror, up each curved side of which, were ten graduated drawers. The drawer at the bottom each side might have been five inches across and the one at the top probably less than an inch. While my great Aunt brushed her hair, I was allowed to look in all the drawers, each contained a different treasure, baubles and pins and jewels and broken bits of things even Eva couldn’t name any more. I thought if I had that mirror and those drawers I’d have a little bit of Eva.